While we were in Greece I came across cheap tickets from Mykonos to Paris and I thought to myself, why not. It happened to be my birthday and I felt like I deserved a present. So, off we went to Paris a week later. 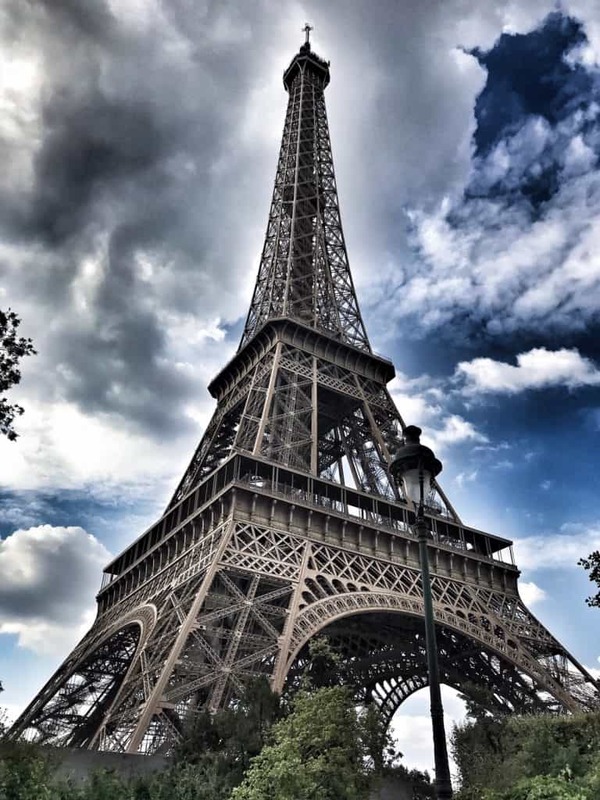 We had two full days to see Paris and since it was an unplanned stop I had nothing planned. But I reached out to a few people and quickly came up with some things for us to do and now can share with you how to spend 2 Days in Paris! If you only have a layover in Paris, I have another post just for you: How to see Paris during a layover! Every day you are in Paris it is realistic to see two major things. For those that are super motivated three would probably be easy for you. To get into Paris from Hilton La Defense go into the mall and take the escalators down to the metro. Buy ticket T plus. To get to the Notre Dam Cathedral take the Metro line one and get off at Hotel de Ville or Chalet-Les Halles. Les Rives de Notre Dame four star hotel operates all year round and is one of the best hotels if you want to enjoy a picturesque hotel. It is located in the center of Paris, near Notre-Dame and is near the train station. The building is a 16th century building that makes it easy for the guest to relive the romantic atmosphere of old Paris and unwind from everyday life. The hotel offers air conditioned, non-smoking rooms with all the facilities a city hotel can offer. Arioso is another four star hotel located near the center of Paris. Arioso is a beautiful 19th century hotel that can provide all the facilities if you are on a business trip. It has a nice view of the city and also offers a picturesque setting in the lobby as well as the rooms. Hotel Du Louvre is located near the Louvre and is one of the most historic hotels of Paris. The hotel offers spacious rooms with all the facilities you may need. The rooms are sound proof and have a wonderful view to the city. Hotel Pont Royal is situated near Saint Germain and has accommodated Hemingway and Sartre. It is a very famous hotel that offers many facilities and a spectacular view. Concorde Opera Paris hotel is a whole new world in the city of Paris. By entering the hotel you see a well decorated lobby with attention paid to every detail. The hotel is situated near Gare St. Lazare and is accessible through metro and bus. It offers a variety of rooms all decorated in the classic Parisian style. Hotel Secret de Paris is located near the famous cabaret of Moulin Rouge. It is a wonderful boutique hotel that is very famous in Paris. All rooms offer office facilities and an excellent view to the most famous streets of the city. The Louvre is also within walking distance. Chateau de Versailles: Located just twenty minutes away from the center of Paris close to the Chateau de Versailles, Trianon Palace Versailles may be a modern hotel, but is full of history. The hotel offers many rooms with a view to the Versailles and other facilities such as spa and famous restaurants. It is definitely one you should visit. The first day I had two goals, Notre Dame Cathedral and the Louvre. This may not sound like much, but I know how bad the lines can get. Our first stop was supposed to be the Notre Dame Cathedral, but I got off on the wrong stop. The metro system can be confusing on your first try. We got off on the Châtelet Les Halles stop, which turned out to be great. At this stop we saw the Jardin Nelson-Mandela, the Fontaine des Innocents, and Paroisse Saint-Eustache. 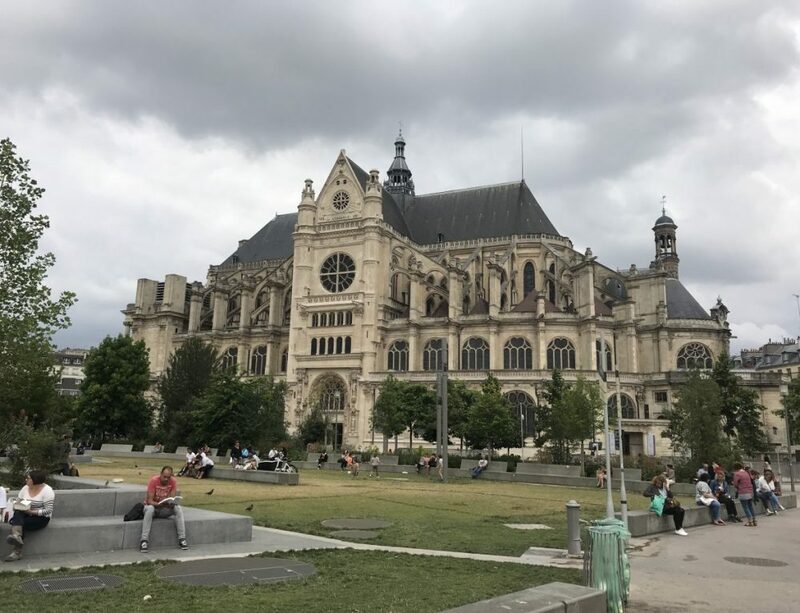 It’s free to go inside Paroisse Saint-Eustache, which is a massive cathedral, so we walked through the church and then made our way towards Notre Dame. I thought it was a great walk. Along the way we saw lots of things like Hotel de Ville, which was closed, the famous street art Chuuuttt! by Jef Aérosol, and walked across the Seine River. When we got to Notre Dame the line was super long. Do not be discouraged by the line, because it always moves fast. It’s free to go inside. I was wearing a sleeveless shirt and was not required to cover up with something. After seeing the Cathedral we walked to a nearby restaurant. I highly recommend researching where to eat after having the worst meal ever at a crepe place. France has Yelp. Near the Notre Dame Cathedral are tons of little souvenir shops. After doing a little shopping I found the shops in this area to be the cheapest. After lunch we caught an Uber to the Lourve. I researched online how to bypass the Lourve line and many suggested various tricks. I found most of those tips to be inaccurate. We got in the main line late in the afternoon, but the line wasn’t long. On Wednesday’s the Louvre is open late and the lines are short, because people do not realize this. Kids receive free admission to the Lourve. My only goal was to show the kids the Mona Lisa. Which is basically everyone else’s goal as well. The Mona Lisa room was extremely crowded and all four of us got separated. I remind planning a meet up point just outside the room, in case this happens. The room smells terrible because there are so many people in the room and people were pushing. On the way to see Mona Lisa you will see lots of Ancient Greece art. Today’s goal is touring the Paris Catacombs and see the Eiffel Tower. We started with the catacombs. We waited in like for almost three hours to go down inside. We could have bought tickets in advance, but I didn’t know this at the time. After going through the catacombs I felt like it was worth the wait. The kids were free. I only had to pay for myself and an audio guide. A lot of people think this place is creepy, but we loved it. We’ve never experienced anything like this. I recommend getting an audio guide in your language, because all the information is in French. They have concerts down here and people go swimming in certain parts! How crazy is that? If you have teens and tweens, I highly recommend visiting the catacombs. Here’s a video of our tour through the Paris Catacombs. I also put together a quick video showing off our two days in Paris. 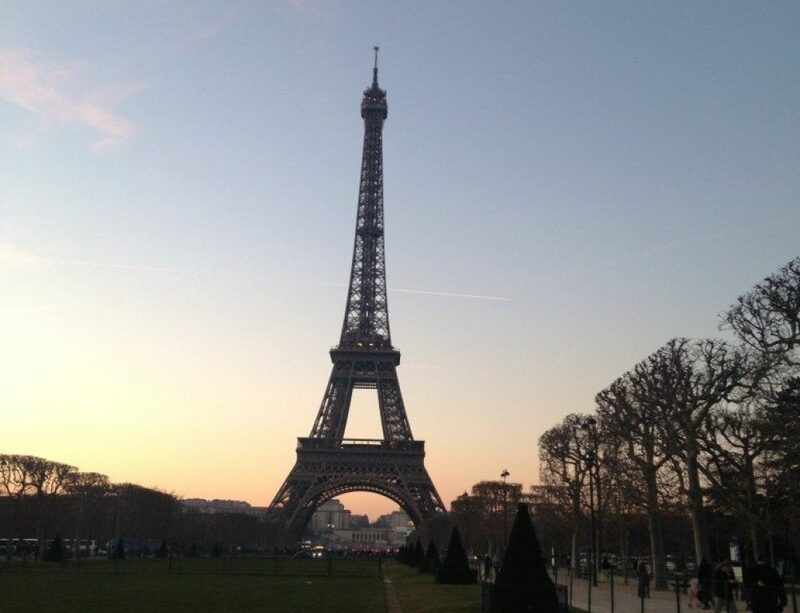 The Eiffel Tower is a must see when in Paris. I wish I had known we were going to be visiting Paris, because I could have booked us for lunch at 58 Tour Eiffel. It’s basically the cheapest way to eat here and get the views. Or I could have bought tickets to go up inside. Unfortunately, this sell out well in advance so there was no way we were going to get tickets or lunch. Instead, we walked around the base, which was good enough for us. 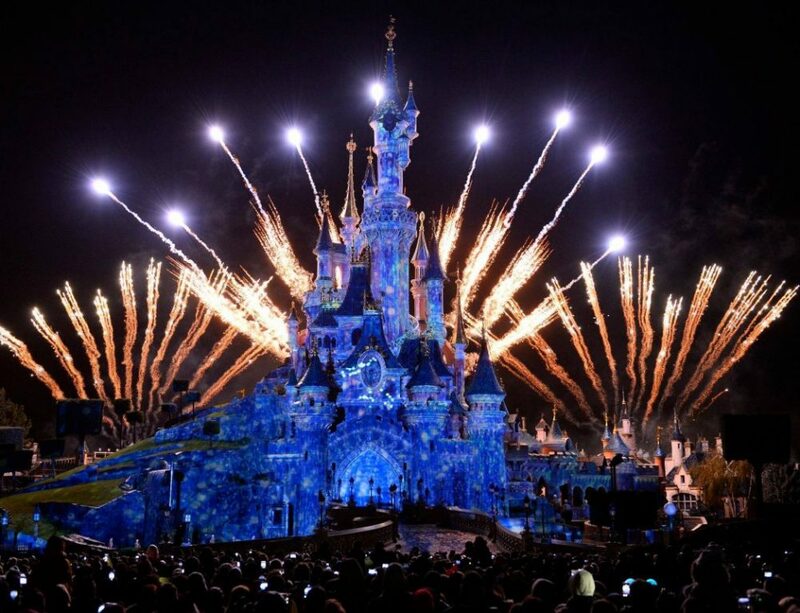 Fun Fact: Every night the Eiffel Tower lights up and sparkles in the hour every hour for five minutes. I feel like I cannot give advice on Paris without discussing the airports. They have two airports and I did not like either. This advice is mainly because Charles de Gaulle, it was horrible. Hands down the worst experience, we’ve ever encountered at an airport. The lines were the worst I have seen anywhere in the world, because Air France employees go on strike all the time. The line system in the terminal we were in was a joke. Maybe other terminals are better, but the Delta and Air France terminal is an absolute nightmare. Get to Charles de Gaulle three hours early. Do NOT check a bag. The line to just drop off a bag is way to long. If you are cutting it close find an airport worker and see if they will put you in a shorter passport control line. If a liquid item is tiny, but there are no markings indicating the size, leave it behind. Security will throw it away even if it’s obviously small enough. Do not get flustered when security asks you to do something stupid. Just do what they ask and say as little as possible. Give yourself an hour to get to the airport, even if the commute says it will only take 30 minutes. Paris traffic and turn quickly. We flew into the other airport south of Paris, Paris Orly. We were in and out of here pretty quick. When we landed and walked out I was unable to spot the metro. I gave up and we walked out to find a cab. There will be “taxi” guys grabbing people as they walk out of the airport, but they are not taxis. There is an official taxi line that you need to get into to get into an official taxi. Our taxi from here to our hotel was extremely expensive. Next time I would get an Uber. I love following all of your trips…saving many of your tips and locations for future travels! Thank you!